KALININGRAD, Russia – Latvia’s environmentalists are expecting support from Russian activists as they bemoan Lithuanian plans to build a new nuclear power plant so close to the two countries’ border – at the already suspended site of the notorious Chernobyl-era Ignalina Nuclear Power Plant (NPP). Latvian ecological non-profit organisations oppose both their own country’s participation in the project and its implementation in principle. In their opinion, going ahead with construction plans would be too high a price to pay for achieving energy independence for the former Soviet states on the Baltic coastline. The decision to restore the Ignalina Nuclear Power Plant – the only NPP ever built on this stretch of the East Baltic coast that used to be part of the realm of the USSR – by installing by 2015 two new reactors with a suggested combined capacity of 3,200 megawatts was approved by the governments of Lithuania, Latvia, Estonia and, finally, by Poland, which later backed these three former Soviet republics in their plans. Lithuania earlier agreed to comply with the demand by the European Union (EU) to shut the Ignalina site down as a condition for the then-ascending EU member state before joining the European club in 2004. 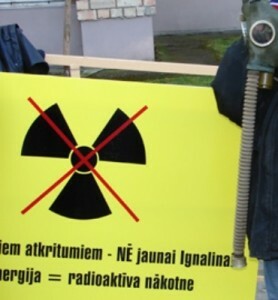 But the proponents of the new NPP try to promote reviving the plant as a cure-all solution envisioned to prevent an energy crisis that is seen threatening Latvia, Lithuania and Estonia after 2009, when, in accordance with EU requirements, those last reactor blocks at Ignalina that remain in operation will be finally taken off-line. This “panacea,” say NPP supporters, will also help the three nations achieve independence from foreign – namely, Russian – energy resources. “For our public, this is like a special code: Every ‘good Latvian citizen’ must be for the NPP, because opposing this project is tantamount to supporting ‘Russia’s imperial ambitions,’” Dainis Ivans, a popular politician of post-Soviet Latvia, told Bellona Web commenting on the state’s drive to build the new plant. Ivans led the Latvian Social Democratic Workers’ Party from 2002 to 2005 and now chairs the Ecology Committee at the city parliament in Latvia’s capital, Riga. A journalist since 1979, Ivans became one of the founders, and leader, of the Popular Front of Latvia in 1988 and he is not completely alien to patriotic causes: His Popular Front was championing Latvia’s independence from Soviet rule. But he gained public acclaim even before the break-up of the Soviet Union when in 1986 he ventured into environmental activism by opposing construction of a new hydro-electric dam on Daugava River, one of Latvia’s major waterways, near the city of Daugavpils. As a result of the information campaign that he started in 1986, the construction project – which would have led to the relocation of numerous towns and villages in the area and ruined the landscapes along the Daugava – was permanently halted. “People were telling me: What are you, a fool? You think anyone can stop a process that the USSR had invested 20 million roubles into? But within a year, we had raised public [opposition] and stopped the (construction) that was destroying the environment,” Ivans reminisced to the Russian new agency Regnum while voicing his support for the opponents of the new Lithuanian NPP project. Daugavpils as a hazard area: Haven’t we been here before? On September 3rd, a public debate started before the regional administration of the Daugavpils Region. The hearings on the programme of environmental impact assessment study for the new nuclear site at Ignalina were joined by representatives of several ecological organisations in Latvia: the Latvian Green Movement, the environmental protection consulting bureau Ozols, Environmental Protection Club of Latvia, and the Latvian branch of Friends of the Earth. By organising this rally, Latvian environmentalists launched their information campaign against the new Ignalina. They plan to provide their fellow countrymen with truthful information about the potential risks – and real expenses – that could be expected from the operation of nuclear power plants in general and the new one in Lithuania, in particular. Latvia’s Daugavpils and its 38,000 inhabitants will end up in a 30-kilometre estimated “risk area” that would be created by production at the plant, which is slated to be built on the site of Ignalina on the banks of Lake Druksiai – in immediate proximity to the Lithuanian borders with Latvia and Belarus. 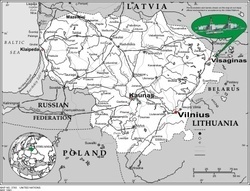 Another large urban area, Lithuania’s capital Vilnius, is some 130 kilometres away from Ignalina. According to Valentina Gadzane, head of the rural Latvian municipality of Demene – which is located just south of Daugavpils and is Latvia’s southernmost territory along the borders with Lithuania and Belarus – area residents are strongly opposed to the construction of the new nuclear facility at Ignalina and disturbed by how little consideration their government seems to be giving to their concerns. “Prices for land are falling, and farming and countryside tourism are at a low because as soon as people find out that a nuclear power station is right in the neighbourhood, no one wants to buy food produced here or even visit these places,” Gadzane said at a previous protest rally in Daugavpils, on March 14th. To add injury to insult, say Latvian ecologists, Ignalina project developers are simply violating international legislation by pushing ahead with the plans as they effectively exclude citizens of neighbouring countries from the process of public hearings. The environmental risks assessment procedure is applied to the construction of the new Baltic nuclear site as an activity that may have potential impact on eight countries of the region: Lithuania, Latvia, Estonia, Poland, Belarus, Finland, Sweden, and Russia. The procedure itself is regulated by the Espoo Convention – the Convention on the Environmental Impact Assessment in a Transboundary Context, developed by the UN’s Economic Commission for Europe and signed in Espoo, Finland in 1991. This document is the main international legal act serving as a basis for transboundary ecological risks studies. Nuclear power plants fall under Item 2 of Appendix I to the convention, which lists activities with implied risks of harmful cross-border environmental impact. In accordance with the Espoo Convention, the so-called “Party of Origin” – the country that initiates an industrial project with potentially detrimental consequences for neighbouring states, or, in this case, Lithuania – has the obligation to afford the communities of the so-called “Affected Parties” – those neighbouring states – the right to participate in a study estimating the risks of such a project. Furthermore, the opportunity to take part in this study must be given to the neighbouring countries in the same scope as it is provided to the public of the Party of Origin. The relevant “Programme for the Environmental Impact Assessment Study for the New Nuclear Power Plant in Lithuania” has, indeed, been developed by the Lithuanian Energy Institute’s Laboratory for Nuclear Engineering and Finland’s engineering and consulting outfit Pöyry Energy Oy. However, as of July 30th, this programme was only available for public viewing in Russian, English and Lithuanian – and only a brief outline of it has been offered to Latvian speakers. On August 7th, the Latvian Green Movement sent letters to the nuclear project’s operator company, Lithuania’s Lietuvos Energija, and to the Lithuanian Ministry of the Environment, requesting that these authorities provide a fully translated equivalent of the 85-page environmental impact programme complete with all addenda in not only Latvian, but Polish and Estonian as well. On August 10th, in his own letter to Lithuanian counterparts at the state ecological authority, Latvia’s environment minister Raimonds Vejonis confirmed his country’s intent to participate in the risks assessment hearings and further emphasised that it was unacceptable that Latvia’s residents and authorities were only provided a general synopsis of the programme. He demanded that a Latvian translation of the programme’s documentation were made available in full. As Ivans said, these demands have not been complied with as yet. However, since the public outcry took place in Daugavpils, the community and environmental experts have until September 21st to address their comments and remarks on the project to the Latvian environment ministry, which will then forward them to Lithuania. Project developers will have to take those comments into account before preparing their final report on Ignalina’s potential impact on ecology. Opponents of the new Ignalina point out that the only option that will ensure the absolutely stable, safe and accessible supply of energy to today’s population and future generations of Baltic citizens alike is the development of renewable sources of energy, such as wind and bio-resources. It is investing into that development that should receive priority from the point of view of financing, research and practical use. Ivans backs the Green Movement’s leader in this opinion and thinks that the Latvian government’s politically motivated participation in the Ignalina project is, in fact, a disservice done to the country’s public. “I would like to bring it to notice that the support of Russian greens is very much in need here now, because some of our top officials – much like Lithuania’s proponents of a new Ignalina – are trying to prove that the new reactor has to become the basis for our energy independence from Russian (energy) resources,” Ivans said.